This was another 7"sent to me to review. As soon as I looked at the back and saw that they crammed nine songs on to one 7", I figured this would be bad news. While I guess it isn't quite as terrible as I had feared, the vast majority of the songs on here are pretty awful. 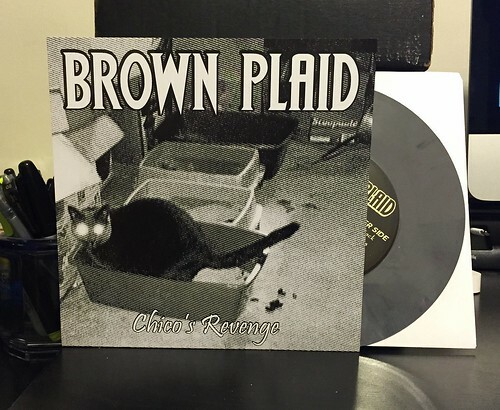 Brown Plaid is aiming for that early Screeching Weasel sound. I'm not sure they achieved it, but I can't say that I've ever been a Screeching Weasel fan either, so maybe they did. What you've got here are 9 short snotty blasts of average pop punk a la Screeching Weasel or maybe early Queers (Just so you know I still haven't said "Screeching Weasel" as many times as it's written on the band's Bandcamp page - well now I've written it the same number of times). Brown Plaid leans heavily on that non-stop galloping drum beat that drives me out of my mind. The songs are so dense and crammed full of drums, guitars and shouting that you can't really hear anything that's going on. Occasionally you'll pick up a nugget of lyrical wisdom like "Hippies stink, literally," but for the most part this isn't good. I always say that I appreciate when anyone takes the time to send me a record, and I do. If I had one thing good to say is that when the band does slow everything down a little bit, like on "Baby Wants A Bottle," you can see some potential here. If they started working on those hooks, slowed things down a little bit and weren't so insistent on making silly, dated jokes they could be on to something.